Everyone has held a dream or passion deep inside, unable to express or challenge it because of the fear of being ridiculed and told to give up. It is the current harsh reality in Korea, where the youth of the society, who should be the most inspired and passionate, give up their dreams for a stable job. The musical Infinite Power recognizes this unfortunate reality while telling a story about Han Won-shik, a man who has pursued his dream for over 20 years, and also about his teenage children and the jobless young men and women who live in his boarding house. The main conflict derives from the machine that Won-shik has worked on almost his whole life, which he believes can create ‘infinite electrical power’ and how others view this seemingly impossible feat. Ultimately this draws the question ‘Do you believe in the impossible?’. Through a relatable wellknit storyline, the high quality of musical numbers and a profound message delivered by this symphonic theater, not only do viewers find solace, but they also find the answer itself. Based on the popular 2008 web-toon series by the cartoonist Joo Ho-min, Infinite Power brings laughter, tears, and comfort, all in a small ball of hope that touches the hearts of those who need it the most. Infinite Power begins with the main character Jang Sun-jae, moving into the boarding house where the infinite power machine resides. Sun-jae is a jobless young man whose dream is to work at a big financial company but is losing hope about his future after several trialsend up in failure. He is pressured byhis family, feels inferior to his friends,and has low confidence in what he hasachieved. Contrastingly, the people thathe meets in the boarding house all havevague and indefinite futures but maintaina positive attitude and are optimistic.This includes Jin Gi-han, who droppedout of veterinary school to become agovernment employee, Kim Sol, who works various part-time jobs after giving up her dream of dancing due to financial problems, and the most optimistic of all is the owner of the boarding house, Won- shik, who has devoted years in creating his ‘infinite power machine.’ He lives with his two children, Soo-ja and Soodong, who are both in their late teenage years. What Sun-jae finds interesting is that everyone at the boarding house shows great support for the machine, seems unworkable from his perspective. However, as their belief in the machine seems to relate to their positive attitudes toward their difficult situations, Sun-jae starts to slowly mimic their attitudes as well. As time goes on, the members at the house become a family supporting each other, and Sun-jae even begins to feel attracted to Sol. However, as Gihan overcomes his trauma with animals and re-establishes his dream, and as Sol gets a job that matches her passion, the situation for Gi-han and Sol seems to improve, unlike Sun-jae’s situation. Sunjae falls into a bigger hole of despair by comparing his failure with their success. He starts losing faith in his future again along with the machine’s potential of functioning, even ignoring Sol and those surrounding him. The conflict does not end there, as Wonshik becomes hospitalized. His situation causes him to question his dream and his children begin to feel resentment towards the machine that caused their father’s injuries and brought hardships to the family. The future of these relatable characters and how they overcome their reality and problems is what makes this musical riveting. The open ending to this story conveys not only hope but also lets the audience ponder over the question of whether they believe in achieving the impossible. Although the main question asked throughout the musical is whether the machine will work or not, the real question is whether or not people should believe in and pursue their dreams. Not all dreams are achievable, but what is worse than failure is when one does not even try. “Before you die, will you remember an unfinished meal or an unaccomplished dream?” is a quote from the musical everyone should think about carefully. 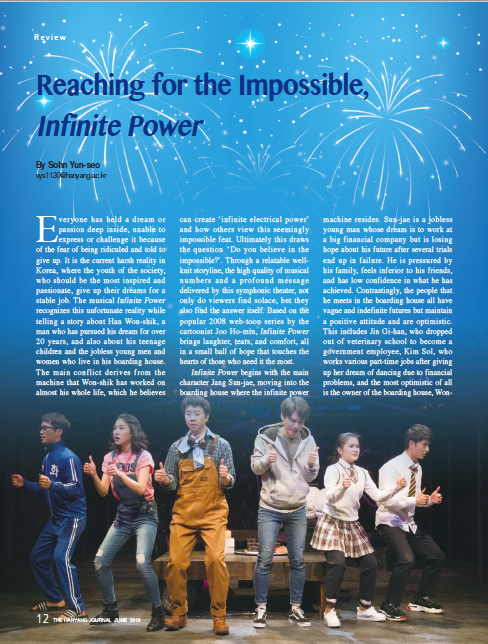 Although the concept of Infinite Power is unique and compelling, the theme and message of this musical itself is quite common. However, in the current Korean society where giving up on dreams has become a norm and young people are lonely, hopeless, and constantly hurt by reality, it is important tha t the s e ‘ c l i ché ’ t h eme s a r e continuously brought up in the media and art by acknowledging the problems in society, but also bringing consolation. Infinite Power deals with deep themes but it does not lack in comedy or touching scenes. Musical numbers vary from lovesick serenades to humorous upbeat tunes and there are many relatable scenes that any young job seeker will have experienced, such as nervewracking interviews and blaming oneself for all kinds of failures. The relatively small stage and cast provides an intimate and cozy feeling to the overall performance and the cute, quirky characteristics of the musical surprisingly fits well into the meaningful message of the importance of pursuing one’s dream and never to stop believing.